A local church has a Julian group with an opportunity for group silent prayer. Silent prayer is a Good Thing. I re-read Julian of Norwich last summer. Julian is a Good Thing. But I don’t understand why Julian is associated with silent prayer. The Showings are initially an extended meditation on Christ crucified with Julian in dialogue with Christ. Please can someone tell me the chapters in the book where Julian recommends silent prayer? That's a good question. I Googled and there are lots of Julian silent prayer groups. FWIW, I guess these groups are seeking to support a more meditative, contemplative approach to prayer. It is worth reflecting on the word 'Reflections'. Of Divine Love. Julian was a contemplative and her remarkable writings reveal the results of that contemplation. Contemplation includes, but is not limited to, what is often described as silent prayer. So I see the connections which have been made. I guess you will have to judge, or ask questions about, the objectives of the group. Does not directly relate to Divine showings but her choice to be an Anchoress. 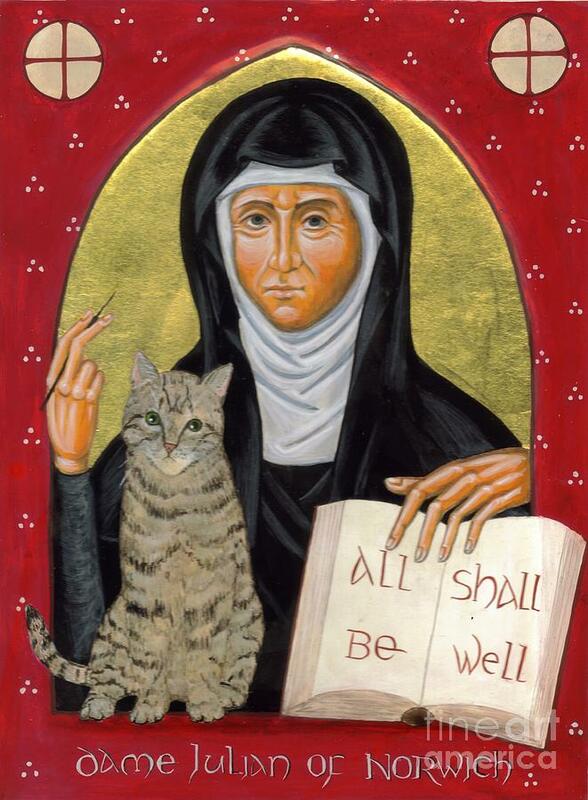 As a result of which Julian of Norwich is often shown with a cat. The alternative for an active devotion was a monkey. My source for this information is the same as that used here. Sure. Julian was called to a particular contemplative life. She is an example of the unexpected fruitfulness of that enclosed calling. If that acts as an encouragement to folks to contemplate, that's a good thing.